Teachers - check out some of the programmes available for your classes in Term 4 in our latest flyer here! These are only a sample of what we can do for school classes. Let us know what your LEOTC needs are and we canwork with you to create a programme. 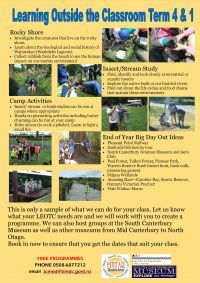 We can also host groups at the South Canterbury Museum as well as other museums from Mid Canterbury to North Otago. Book in now to ensure that you get the dates that suit your class.